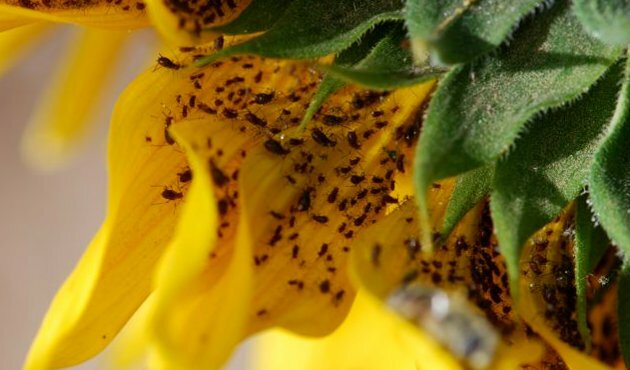 Pests of sunflower harvest: Whom you should beware of? If only planting sunflowers was enough. One should also make sure that weather conditions don’t cause damage to the harvest. But the real danger here is pests. They destroy plants and can cause various diseases. The only salvation is to cultivate sunflower crops on a regular basis. What insects are the most dangerous? What is affected the most? Sunflowers have a highly developed root system. It grows almost up several meters deep. It is impressive because the stem itself grows 1.5-2 meters high and the root is 1 meter width more. Just imagine the scale of the root system on dozens of hectares! This is why the underground part of a sunflower is one of the first to be at risk as well as its stem. The latter one is sturdy and thick. But its core can still be affected as it is quite loose. Leaves are also posed to danger and there can be 15-30 leaves just on one stem. And the most important for the industry are sunflower heads which have many seeds. So, one should watch out for the pests that affect them. They are a common problem not only for sunflowers and their crops. Aphids affect different kinds of fruit trees and even weeds! ‘Aphids’ is a collective name for more than 4000 small insects. They damage leaves but actually they don’t pose any particular threat because ladybirds and the like eat them rather quickly. But there are also some aggressive periods of infestation when it is necessary to treat plants with insecticides right away. These moths are especially active at night. The first and second generations of their larvae destroy leaves, and others destroy the entire vegetation of a sunflower. To get rid of these pests once and for all is almost impossible, but to reduce their number is possible. To eliminate all pupae, it is recommended to apply special winter irrigation. Their number is being controlled using pheromone traps. It is a very dangerous beetle. Despite the fact that an adult reaches about 5-7 millimeters long, it is able to destroy the crop almost completely. Weevils feed on young plants by ruining a growing cone. These insects choose the sunflower fields for oviposition and wintering. One of the well-known ways of dealing with them is the practice of crop rotation. It is one of the most dangerous pests. It can cause permanent damage to the harvest. This moth gets into the grains and eats kernels. Moreover, the insect makes long passages in the sunflower head. It eats up about 60% of the harvest and it can destroy up to 100% of the plantings! The insect itself does no harm at all. The true enemy is its larvae! Their habitat is chernozem and their diet consists primarily of plant roots. As a result, sunflowers either slow down their growth or yield no harvest at all. That’s why one should monitor the number of these pests in soil. Growing a sunflower is a hard and time-consuming job. To get a fruitful harvest, one needs to work thoroughly throughout the entire growth cycle of the plant.